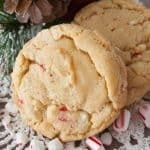 These Candy Cane Cookies scream Christmas! If you are looking for a quick and easy peppermint chip cookie to add to your holiday baking this is the one! Preheat your oven to 350 degrees and lightly spray your baking sheets with non-stick cooking spray or line them with parchment paper. Unwrap and coarsely chop the candy cane kisses. In a mixing bowl, cream the butter flavored shortening and sugars. Beat in the eggs, vanilla, and peppermint. Stir in half the flour, then the chopped up candy cane kisses, then the last of the flour. Scoop the dough out by tablespoonfuls onto the prepared baking sheets and bake at 350 for 10 minutes. The cookies will look puffy and slightly browned around the bottom edges. Many of you may be tempted to substitute butter or margarine for the butter flavored shortening. I strongly advise you not to do that. The shortenings purpose is to give these cookies a little bit crispy outside and a soft inside that you won’t get with butter. Also if you sub in butter these cookies will spread out super thin and the taste will be noticeably different that it should be. You MUST also use butter flavored shortening, not regular shortening.